So how do you like Oregon’s Bottle Bill now? Now, that the law covers so many more beverages in addition to water, soft drinks and beer? Seems like the Albany Bottle Drop, the redemption center of the Oregon Beverage Recycling Cooperative, is almost always busy. The busier it gets, the more people might wonder about the wisdom of centralizing the return of pretty much all beverage bottles and cans in one spot. That happened in August 2015. At first it seemed like a good idea. 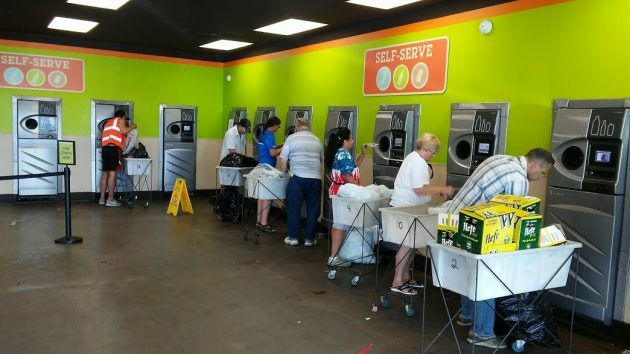 No more standing at drafty, smelly and often balky machines outside the various supermarkets and stores. But as more items have been added to the deposit requirement, visiting the central redemption center may be losing some of its initial appeal. Now it means feeding a machine and breathing beer fumes indoors. You can get around it by signing up for bagging your empties and dropping the bags down a chute any time you go by there. No standing around, but they charge you something for the bags. Speaking of which, the OLCC has just issued a reminder: If you still have empties on which the deposit was a nickel, you must return them by Sept. 30 in order to get the refund, which now is a dime since the deposit went up to 10 cents in April 2017. After this month, no more refunds on any 5-cent-deposit items. But the OLCC points out you can till recycle them. Which brings up an old point. Why don’t we just drop all this deposit-and-return rigmarole and put the empties into the recycling bins that just about everybody has? It would save the hassle of storing those things until the bags are full and then running them to the redemption center, which is a separate trip unless you have other business in that part of town. It all started because we wouldn’t recycle voluntarily. At least not enough.if there was a deposit on cigarette filters we probably would go and return them too. Nice idea! Smoking-disincentive tax, environmental benefit, and income for those who scrounge for a living, all rolled into one. It is sad that the center will only let you deposit $35 worth at one time. If we drive into town to make a deposit, seems ludicrous that one can’t make it worth their time. I think the central center is a good idea, may just need more of them or larger. Purely anecdotally – it seems that redemption/recycling has increased with the expansion of the bottle bill (more beverage containers and more value). The point is to increase recycling. It also is a good opportunity for youth fundraisers. Many teams, clubs, etc. will collect your cans as a donation. The one idea the State never considered, a concept under-examined, would be a simple ban on most canned beverages, particularly offensive drinks such as any and all Light Beer brands. Bud Lite and Miller Lite are particularly guilty of producing mediocre brews, forcing beer lovers to pay an extra 10-cents per can for the atrocious fermentation. Orthodontists, Pediatric Dentist and Pedodontists…as well as the shareholders of the manufacturing corporations. Eliminate all but the healthiest drinks and this entire can return/deposit debacle becomes moot. And, Americans will no longer be spending billions to undo the damage done by carbonated criminals. The state said it wasn’t getting it redemption goal before going to .10 They also said they don’t include what most of us do when it’s not worth the time and fuel to return bottles and cans were putting them in our recycle bins. If they included those in their goal it would no doubt put us over. Hasso is right. We already pay plenty for the recycling bins. Either get rid of this creepy deposit law or drop the requirement for the bins. No one has mentioned that homeless people and poor people depend on the money they get from returning bottles and cans for the deposit. And, yes, if we dropped the whole deposit-return system, littering, which is already out of hand, would increase and recycling wouldn’t increase. As Mark Twain said, “People are no damned good.” I’m sure he didn’t mean all people, but we know what he meant. If any of you live by a high school, if you awoke from a coma in September, you would know which day school started because the kids throw their fast food bags, cups, what have you in the gutters on Albany Streets that feed into Queen Avenue. Yes, I’m talking about West Albany High School kids. I’d be hugely supportive of a trial period of a few years with no deposit law. If the trial period showed a big increase in litter and a large decrease in recycling, then bring the bottle bill back but force grocers to count the containers like in the old days. The machines are totally lame. What about stores? If they have 5 cent cans, are they going to charge you 10 cents? This wouldn’t seem right. Where does the deposit the grocery stores collect go? The wholesalers keep the money for the non returned containers for which a deposit was charged. My best guess is it adds up collectively to a million dollars a year in our community. A substantial windfall for Pepsi, Coke, Coors and Budweiser distributors. Drink bottles (beer and soft drinks) weren’t recycled during my childhood, the were reused. The bottlers charged a deposit to encourage return. 1 – The deposit was high compared to the total price, and high altogether. Five of them would get you a real silver dime, making each bottle about 3 times as valuable as the current 10-cent deposit. Maybe the bottle-making cost was high enough to make reuse important to drink makers. 2 – Notice the large increase in size since then. Combined with inactivity in children today, you know the results all too well. Just visit a state that doesn’t have deposits and you will see the benefits we enjoy. The deposit is an incentive to pick up the containers others toss out of their car windows. I heard on the radio this afternoon that there was a revision issued by OLCC that stated that the 5 cent cans would be redeemable indefinitely. The September 30th restriction only applies to retailers that have containers marked with the 5 cent deposit. They will not be able to sell these after that date. Ever since the change to the 10 cent deposit rate I’ve noticed a significant reduction in roadside cans and bottles during my litter walks! However, there is still is a substantial amount tossed out along our roadways. And being that the 1st deposits were initiated some ~45 years ago, a 20 cent deposit rate would be more inline with the cost-of-living increase and a better incentive! The deposit amount should also be extended to alcoholic beverages, (regardless of container size), which are plentiful, especially near areas where homeless frequent!